TimberMart-South (TMS) provides quartery reports on market prices of major timber products for 11 U.S. southeastern states. Below is a map illustrating the TMS region. 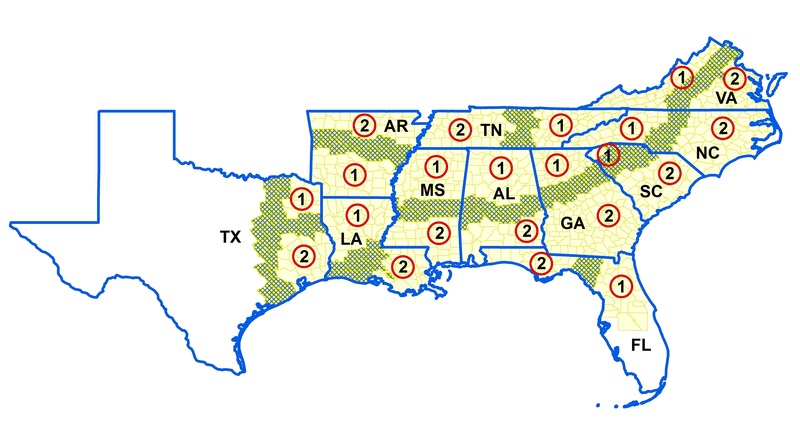 Counties in yellow or green represent TMS coverage areas. Counties highlighted in green denote transition areas among the two regions. Prices are reported for two regions of each state, denoted by the number 1 or 2. For product specifications used for sawtimber, chip-n-saw, and pulpwood, click here (in .pdf format). TimberMart-South is a copyrighted publication compiled and produced at the Center for Forest Business, Warnell School of Forestry & Natural Resources, University of Georgia, under contract with the Frank W. Norris Foundation, a not-for-profit organization serving the forest products industry.